A local artist uses murals and grassroots organizing to effect positive change in his Northside community. Arnoldo Hurtado is working on the 110-foot mural to be partially completed Saturday with volunteers and staffers from the Modern Art Museum of Fort Worth. Photo: Arnoldo Hurtado. Four years since forming the grassroots group Comunidad 27, Northside resident Arnoldo Hurtado believes the crime that had long plagued his neighborhood — gun violence, drugs, prostitution — has largely subsided. Comunidad 27 has grown into a multifaceted volunteer effort with around 25 active members, an active Facebook page, regular public meetings and events, crime prevention initiatives, and, more recently, efforts to improve the quality of life along NW 27th Street, where Hurtado grew up and currently resides. On Saturday from 7 a.m. to noon at Franko’s Market (2622 Azle Ave.), Comunidad 27 will host a free public event billed Paint a Mural! Food will be provided by the public-private partnership Blue Zones Project and a local church. Volunteers and staffers from the Modern Art Museum of Fort Worth will paint the 110-foot mural and hand out free museum passes. 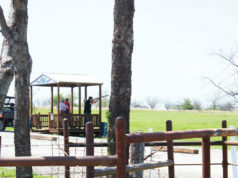 The aim of the event is to foster pride among area residents and to connect community members. The grassroots effort began four years ago as a way to address crime in Hurtado’s neighborhood and an alleged lack of interest from the Fort Worth police department, Hurtado said. With alleged late responses and little follow-up by police, Hurtado said his family decided to discuss the problem and other petty crime issues directly with neighbors. Hurtado quickly realized that, while area residents were witnessing the same problems, they weren’t discussing it. 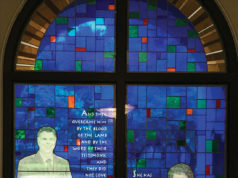 One early breakthrough came when Hurtado connected with Rosalinda Mendoza, a crime prevention specialist for the Fort Worth police department. Part of his work included overcoming mistrust between the local Hispanic community and law enforcement. In late 2016, dozens of Fort Worth police officers, including Chief Joel Fitzgerald, joined the residents of NW 27th Street for the annual crime-prevention initiative National Night Out. After residents in Hurtado’s neighborhood began taking crime prevention seriously and coordinating those efforts with crime-prevention specialist Mendoza and other police officers, “word got out” that residents were no longer tolerating criminal activity, Hurtado said. He said incidents of break-ins and petty crime have dropped significantly in recent years. I reached out to Fort Worth Police Department for crime statistics over the past four years but was told the data wouldn’t be available in time for this story. There were “a lot of gang-related [robberies] going on,” she said. “We still have some of that here and there. Now that we are watching out for each other here, there has not been” as much crime. Comunidad 27 is now focused on the revitalization and beautification of the neighborhoods around NW 27th Street. The group regularly collects signatures to take advantage of two city programs that provide free trees for eligible neighborhoods. Recently, and at the behest of Comunidad 27, ESCOS Construction donated time and manpower to pick up trash along NW 20th Street for Earth Day. The grassroots work has cut down on crime and cleaned streets, according to Hurtado, but infrastructure improvements such as improved street lighting and safe sidewalks lag woefully behind. 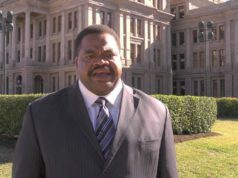 He said many residents remain frustrated at the lack of information coming from city officials about plans for economic development in the area. Sepeda said she would like to see city officials recognize the progress that has happened under Comunidad 27 and to use the grassroots model to improve neighboring Northside communities. 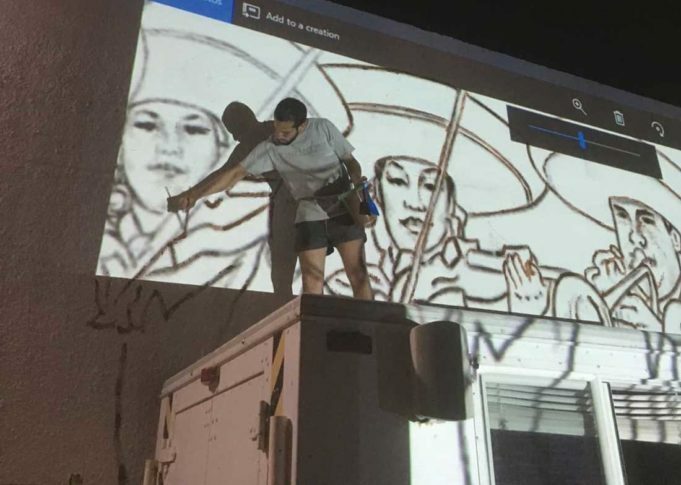 Councilmember Carlos Flores, whose district encompasses NW 27th Street, said in an email that his office has offered advice and support for the mural. The mural’s central theme is a rendering of the North Side High School’s Mariachi Espuelas de Plata. The award-winning mariachi group, whose members recently performed at Carnegie Hall, reflects many of the Northside values that should be championed, Hurtado said. Photo: Arnoldo Hurtado. 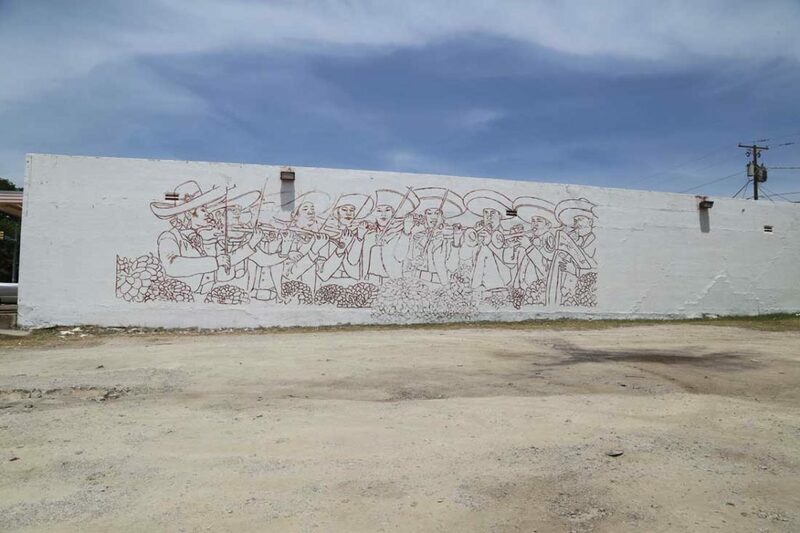 Completion of the massive mural project could take a month or longer, Hurtado said. The mural’s central theme is a rendering of North Side High School’s Mariachi Espuelas de Plata. The award-winning mariachi group, whose members recently performed at Carnegie Hall, reflects many of the Northside values that should be championed, Hurtado said. Thanks, Mr. Brown, for a great story, well told. Hurtado is a hero. I’m looking forward to checking out the mural when he’s finished and more of his work. God bless you both.